Όμορφη βίλα 3 υπνοδωματίων με ιδιωτική κρεβατοκάμαρα. Μερικά βήματα για την κύρια πόρτα και 2 δωμάτια για τα δωμάτια αλλά διαφορετικά σε ένα επίπεδο. Τηλεόραση και DVD player στο σαλόνι. Κουζίνα με όλες τις ανέσεις, inc. φούρνο, εστίες μαγειρέματος, φούρνο μικροκυμάτων, ψυγείο-καταψύκτη, τοστιέρα, βραστήρα, καθώς και βοηθητικό δωμάτιο με πλυντήριο πιάτων και πλυντήριο ρούχων. Εκτενής υπαίθριος χώρος με πέργκολα, εξωτερικό ψυγείο, μπάρμπεκιου και πισίνα. Καλά συντηρημένοι εσωτερικοί χώροι και χώροι. A / C μέσω συν ανεμιστήρες οροφής. Its annoying to be charged in GBP in a country which has the EUR. Especially if the deposit is actually charged to the customer instead of only blocking the appropriate amount. The outdoor furniture was very dusty an had to be cleaned befor we could use it. Otherwise the house is ok an has everything one needs. I am sorry about the payment problems. I will pass this feedback onto HomeAway as this is out of our control. The furniture is cleaned prior to every visit but the wind carries a lot of dust in Cyprus. Guests can contact the manager immediately if they have any problem. Thank you for your feedback. We thought the villa was excellent - all we needed for a holiday, and the garden and pool were also excellent. There is a brand new pagoda in the garden where you can lounge, sit and eat out of the sun, with fans and lighting, essential for al-fresco living. The gardens are spacious and there are a number of secluded places for a quiet read out of the sun! The bedrooms are at each end of the villa, with separate bathrooms, and provide total privacy for two couples or families. Spacious wardrobes and cupboards throughout the villa which means you can hang up all those holiday clothes for a change! We hired a car for the two weeks, which is essential. 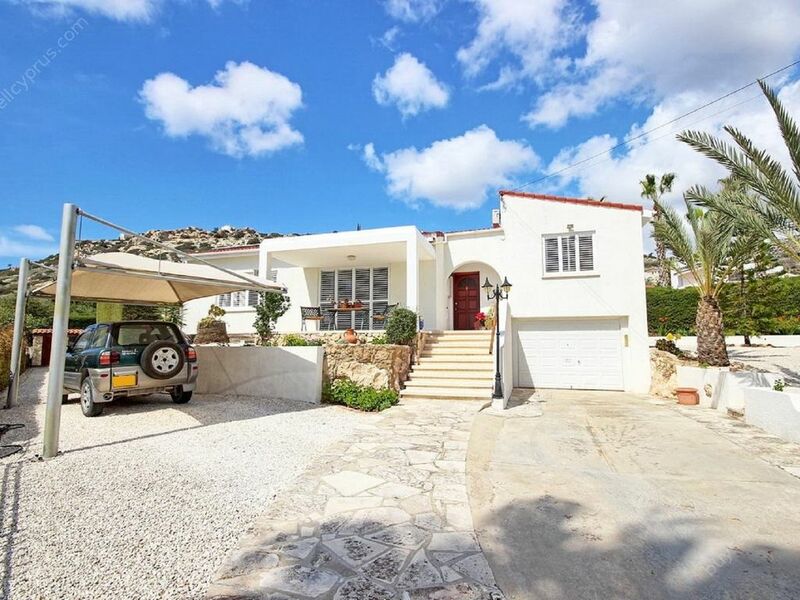 Peyia is a 4 minute drive, which has some good Cypriot restaurants and a couple of supermarkets. There is a much larger supermarket within 10 mins drive near to Coral Bay, where there is a wider selection of shops and restaurants. In addition there are three beach bars, again within a short driving distance, which all provide excellent meals and views of the Cyprus sunsets. Overall a fantastic holiday, the location in particular, and the spacious villa and gardens really made it for us - very relaxing. We had lovely stay at this Villa. very clean, lots of equipment you need for holiday including towels.. The outdoor area is what drew us to this property with the pool, sunbeams, etc and everything was perfect and very pretty, shady areas to get out of the sun and the pool temperature was brilliant. You will need a car for this Villa as it is a little way out of the Coral Bay area with the restaurants and Bars etc. we saw a bus stop at the bottom of the road but never a bus? i would recommend anyone getting a car anyway to travel around the lovely island, we loved Latchi and Polis Beaches the most, Latchi has a wider selection of restaurants by the seafront, and Polis is more quiet but has a lovely little beach bar for food and drinks etc. set near a camp site so you have shower rooms and toilets that are open to the public not just the campers.. we loved both... and with lovely mountain views on the way. There is a little cypriot restaurant near to the villa called Savvas Grill which has traditional cypriot entertainment on a friday night, the food was lovely. we Visited Aphrodites Baths while near Lacthi and Polis all close together by car. This is also a lovely place to visit and learn a little of the history etc plus beautiful views when you get to the top of the walk that aphrodite herself walked!! We went to Coral bay beach but personally found it very busy and loud music on although still pretty in itself, if you want to avoid the music then head to the left hand side of the beach away from the beach bar. There is a charge for beds and umbrellas but not to expensive as some places can be....around the £6/7 for the day. we went into Peyia town which is also pretty , we had a meal in the old cinema restaurant which was also very nice and lovely staff. we went to the Tombs of the Kings which was interesting much bigger than we thought. Kids loved the Aqua Water Park. all in all i would Highly recommend this homely villa. Outstanding! Fabulous property. Lovely location. Great location for peace and quiet. Villa lovely. A spacious villa in a quiet residential area which has everything you need for very comfortable stay. The gardens and Pool are especially lovely. You will need a car but there are many places to visit and enjoy within an easy driving distance. We loved it and would definitely stay again.